By combining the mirror and lighting into one, lighted mirrors are practical solutions for small spaces. Available in a range of shapes and sizes, these modern bathroom fixtures feature a traditional mirror surrounded by lights. Depending on the size and shape of the mirror, there is either a single light across the top, two lights along the left and right sides, or a halo of light all around the mirror. The lighting in any bathroom is important. However, in a small bathroom, the darker it is, the smaller it feels. 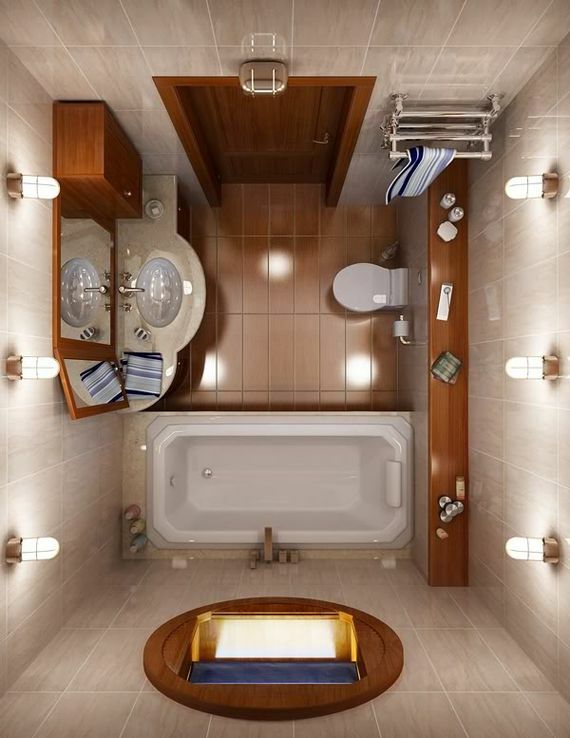 No matter its size, a bathroom should always feel bright and open. When installing lighting in small bathrooms, it is important to create a lighting arrangement that fully illuminates the whole space but does not overpower the room, causing it to feel cluttered and even smaller. Just like in a kitchen, the counter space surrounding a bathroom sink can often be left dark or in shadows because of cabinets or shelves located above it. By adding undercabinet lights to the underside of shelves and cabinets, not only does this space become functional but it also makes the bathroom feel larger by diminishing a dark area. In a small bathroom, every amount of surface space counts. Even the space under cabinets and countertops should not be overlooked. Typically the area under a shelf, cabinet or countertop is hard to light, resulting in a dark space that inevitably causes the room to feel smaller. To combat poorly illuminated shelves or open counter space located under cabinets, install undercabinet lights or tape lights. 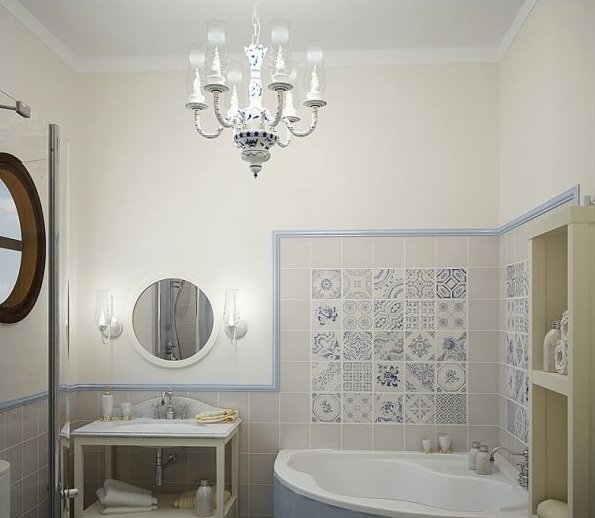 To keep a small bathroom feeling open and spacious, refrain from installing any large or decorative ceiling lights. Instead, a flush mount ceiling light is the ideal option. Lighted medicine cabinets are another great lighting option–as well as space-saving storage solution–for small bathrooms. By combining lighting, a mirror, and storage into one fixture, a lighted medicine cabinet is perfect for not only a bathroom with limited wall space but for one with limited counter space and storage as well. The main tip for small bathroom lighting is to think creatively. Move away from traditional bathroom lighting such as vanity lights, and instead focus on bathroom light fixtures that will maximize the small space for both design and lighting. 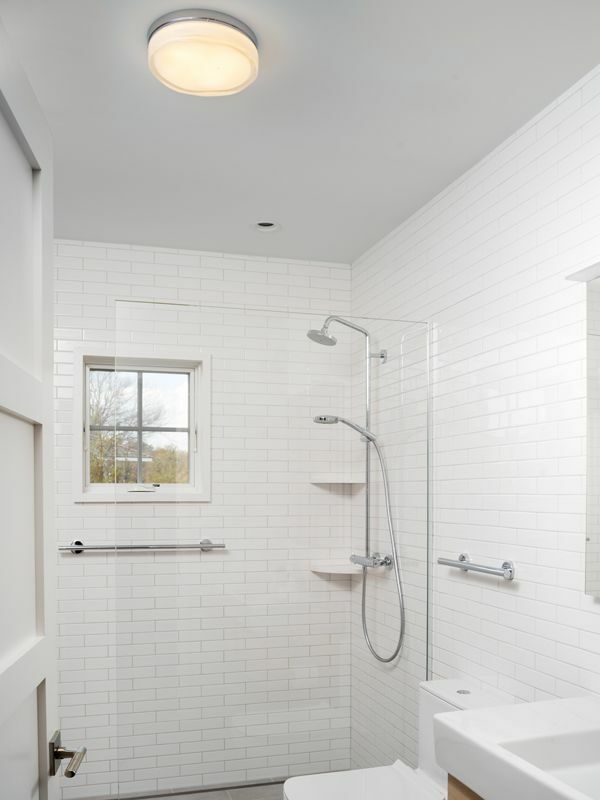 Whether installed together or separately, lighted mirrors or medicine cabinets, undercabinet or tape lights, and flush mount ceiling lights are three innovative and modern small bathroom lighting ideas for keeping the room feeling open and well-lit. Tape lights are another great way to add a layer of light to a small bathroom. These LED lights provide a warm glow that is perfect for hard-to-light spaces, such as below a vanity or in a recessed niche, because of their flexibility. In addition to the light they provide, strip lights are easily tucked away out-of-sight for a neat, tailored look that will keep a small bathroom from feeling cluttered. In addition to fully illuminating the space, the diffused light from the ceiling light will soften the bright light cast from the vanity light or lighted mirror. 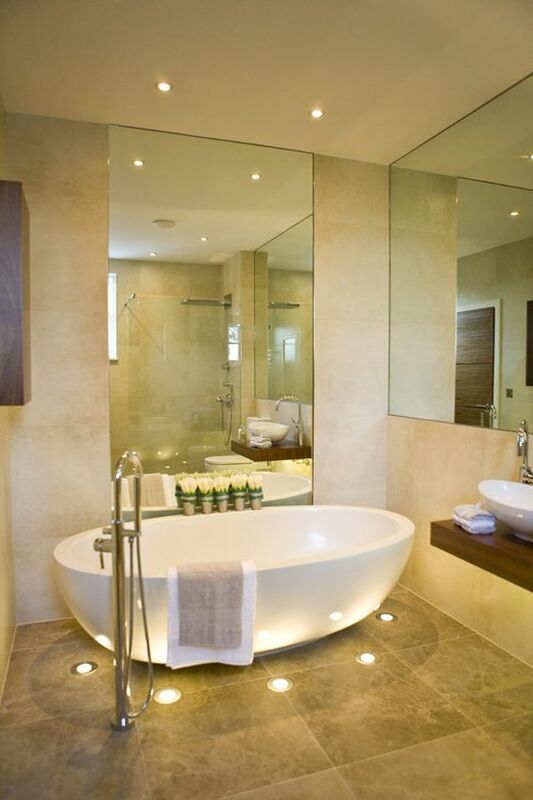 For more tips and ideas on how to light your bathroom, read our Bathroom Lighting Buying Guide. If you have any further questions or want to share any tips of your own for the best small bathroom lighting installation, please leave a comment below and we’ll be happy to answer them. A bathroom ceiling light mounted flush against the ceiling with sleek, clean lines and a white, frosted diffuser will seamlessly blend with the architecture of the room. 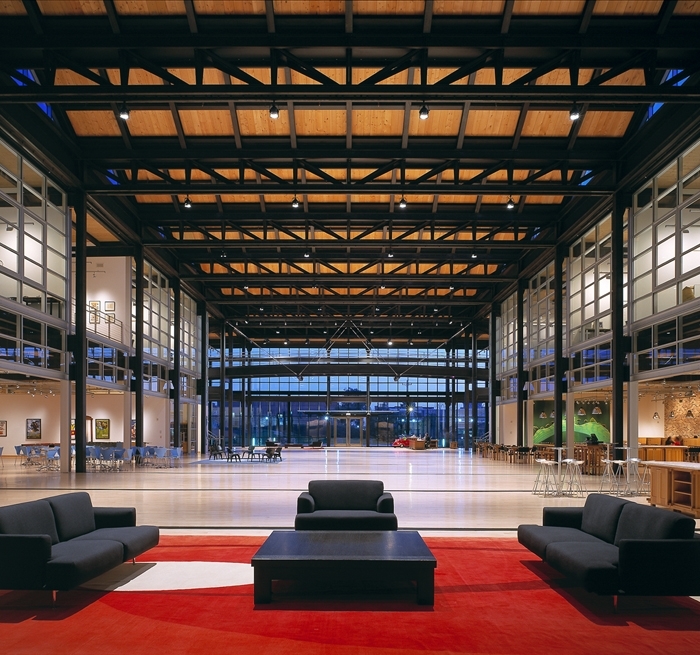 When illuminated, the diffuser will evenly distribute the light throughout the space to keep the area well-lit. Because of the minimalist silhouette and the even amount of light cast, a flush mount ceiling light will keep a bathroom feeling open and uncluttered. 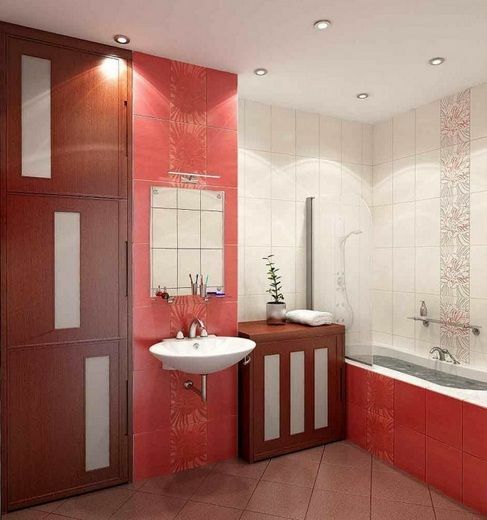 In small bathrooms, vanity lighting is often overlooked, as the space located around the mirror is limited. Instead, the vanity is usually illuminated by light cast from a ceiling light, which results in unwanted shadows and splotchy lighting. A great way to create the bright task lighting ideal for a vanity without having to worry about limited space around the mirror is to install a lighted mirror.